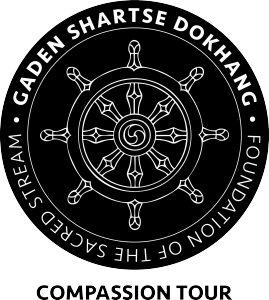 The monks of Gaden Shartse Dokhang are renowned for their expertise in chanting. Not only are they expert at the more popular form of low toned chanting, they are specialists in a higher less known form of higher toned chanting as well. Other instruments will be played and the concert will also consist of some explanation of the chants, history, tradition and so forth. This prayer spreads the light of the truth so that it may flourish in every corner of the world. It is a prayer that negative actions, which result in environmental destruction, wars and disputes, terrorism and nuclear destruction, be ceased forever. It acknowledges that true peace comes from inner peace, not fame, nor lovely things, and offers the wish and intention that all people find inner peace above all. It is a prayer for the end of poverty, which includes the poverty of wisdom as well as economic poverty, so that the inner strength of all beings may be restored. Kangso is one of the main rituals performed in the daily life of the Tibetan people. By offering the melodious sounds of various musical instruments, this ritual is performed as a means of worshiping and making offerings to gurus, meditational deities, and protector deities. Making such offerings helps one to clear obstacles and become more effective at benefiting other beings. The particular Kangso ritual performed on this tour is one that is practiced on very special occasions. For more information or to book a performance with the monks, contact info@tibetanmonktour.org.